I have been working on lots of things behind the scenes at the moment. You know how sometimes you just like to hunker down and get things done? It’s so satisfying! I’ve been sorting out my dad’s estate, getting on top of filing and paperwork, putting together my tax info for the accountant AND writing lots for my next book. I am getting so many ideas and it’s exciting! 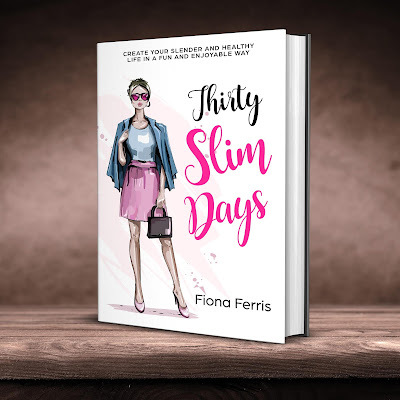 ‘Thirty Slim Days’ is in the process of being re-released with its new cover. As with my other new covers, I am in love with it. I know they say not to judge a book by its cover, but a great cover can make you love something more – I’ve found that with old favourites of mine, both fiction and non-fiction. I hope you enjoy the video, let me know what you think. And a cool feature that I found while uploading it is that you can turn captions on if you have trouble hearing or are in a place that you don’t want the sound on. Yay for YouTube! I wish you a wonderful week and I’ll see you soon! It’s summer here in Hawke’s Bay and it’s been *very warm*. I’ve never lived in a place with air conditioning, but just recently I have been thinking it might not be a bad thing! We have a quote for a few key rooms to be fitted with heating/cooling units, such as my office and our bedroom (plus a few others which are on my ‘wish list’) and I know it won’t be inexpensive. I don’t know if it’s me trying to justify the cost to myself, but I thought ‘if we went on a really fancy cruise or a big overseas holiday, it would cost about the same’. That’s when I felt better about what the quote might be and actually going ahead with it. Yes, I absolute would love to go on a cruise one day because I think it would be amazing and I can feel like I’m on The Love Boat :) but I could also have a cool and refreshing office to write in every-single-day. That excites me way more than a vacation – having a luxurious life every day! I think I used to take air conditioning for granted at the different office jobs I worked at, plus our store had air conditioning too. It’s much easier to feel productive (and chic!) when there is not a trickle of sweat running down your back inside your clothes. It may be my hormones of a certain age that are making me seek coolness too, I know that. This spending decision is in alignment with my desire to live a vacation/resort style lifestyle at home. Making my life as luxurious as if I was in a boutique hotel. And many choices don’t cost extra either. A choice that comes to mind for me is making a plate for nibbles of a piece of delicious cheese (I am loving Castello Danish at the moment), paired with gourmet biscuits (current favourite: grainy) and a washed apple cut in half and cored, then super-finely sliced and fanned a little on the plate. Having this on the table in the late afternoon when I relax before dinner feels like a little bit of luxury, more than junkier snack options do. If I was at a fancy resort somewhere, that’s what I would have with a glass of wine, not potato chips and other junky snacks etc! It’s fun way to think about things, even if I do sometimes feel it’s a little bit decadent. I remind myself ‘you don’t have to be sensible all the time Fiona’ and it’s also a fun challenge for me to work out how to live my ideal life of luxury at no extra cost. 'Thirty Slim Days' is the latest of my books to receive a beautiful new cover. I hope you love it as much as I do! I re-read it - out loud! - to myself taking the opportunity to sift out any errors that slipped through (I found a few!) and it really did re-set my mindset after the holiday season. Because I admit, I did let a little loose. Not as much as other years but I did all the same. It was nice to feel soothed and inspired and ready to be my chic and slim self heading into 2019. If you haven't read 'Thirty Slim Days' yet I invite you to read the sample on Amazon to see if you resonate with what I write. And if you already have it in your library, join with me as I revisit the techniques in my chic toolkit to having a peaceful relationship with food and eating. Some of us find it easy to fall back into old habits because they're comfortable, but it doesn't mean we should give up. Re-inspire yourself with a new idea and you'll be feeling good before you know it! Hi, Fiona, I have just watched your latest video and really enjoyed it, and then seeing your little dog was a bonus! Also, that hedge of agapanthus is amazing ... of course, in Cornwall, the next county, it grows like a weed, as do rhododendrons, but not here in Devon. I hope you get your air conditioning sorted out. Over here you can buy little portable units and when my brother in law said he'd bought one a year or so ago, I laughed and told him he'd bought a fridge ... after all, a fridge is a heat exchanger, ha ha! I do like to tease, rather naughty, really! But proper air con would be lovely. We do have high temperatures here in summer now, all the effects of global warming I am sure. Last year our temperatures soared to around 36C, that is HOT for the UK! We shall have to see what this summer brings, as we're still in winter here. I also love to return (if we've been out, I mean) to a clean and tidy home, and like you, I remove whatever I can from the work surfaces in the kitchen and tidy the sitting room, plumping cushions and even putting the coasters for cups and saucers in a neat pile - just a quirk of mind, I don't like them left around like large postage stamps if they're not in use! I also like to check the flower water each day (provided I remember!) as manky flower water looks anything but chic. It's keeping an eye on the details, isn't it, that provides a chic and luxurious-feeling lifestyle? I remove the daily papers each day - once they have been read, they go into the re-cycling bin; I tidy my magazines, and I try and put the vacuum around, too. Even if the carpet looks clean, giving it a swift hoover really does make a room look better. Also, making sure that when I open the curtains that they hang nicely, another quirk of mine. But details add up, as you will have noticed yourself, and the cumulative effect is for a lovely, tidy home. Enjoy your summer Fiona. I now have a IG account as well as my blog, which is great fun, and I have you to thank for encouraging me to have a blog! Margaret, I do all the little things you do, including the curtains and coasters! And, I love your Instagram handle so much!! https://www.instagram.com/countryandtownmaid/ You do make me laugh :) So glad you are on IG now. Here in the south of France we depend on exterior shutters to keep the house cool. They do a great job--the inside isn't cold, but compared to outside, it's comfortable (if it's 38 C outside, then it's 26 inside...plenty of people would find that still too hot, but we get used to it). The downside is that they reduce the sunlight on the sunny side--if a room has only a sliver of light coming in it's not exactly luxurious. Anyway, we're lucky because our house is laid out such that if the shutters are closed on one side, plenty of light comes in on the other. And shutters don't use electricity, just the human effort to open and close them. I am following my French friends' recommendation for staying slim: never have seconds. So far it has eliminated two kilos. Make an effort to eat healthy food, and just control portions. Interestingly, there was just an article in the New York Times advocating the same thing. It isn't a "diet," but a way of life. Your new cover is terrific! I love it. I have been embracing the idea of acting "as if" and this post on acting as if you are at a lovely hotel, etc. is exactly that same idea. I think it's important to do this. So nice to hear from you. Thanks Kristi! I love my new covers too. Acting as if is just what I do everyday :) It makes life fun. Your posts are so soothing to read, like a calm and enjoyable way to start my Monday morning. The description of your afternoon snack sounds lovely. I've been having a pear with mild blue cheese lately and the combination is delicious. You will never regret air conditioning :) good choice. Pear and blue cheese is a gorgeous combo - I prefer less strong blue cheeses too. Roll on the air con! We are only doing our master bedroom and my office at this stage. Soooo excited for it. Also, your backyard is GLORIOUS! It looks like you are sitting in a luxurious resort. I think that it is the little details that are so important in making a stylish life. Each morning, I fill a pretty jug with water and pop in some sliced strawberries and mint, or lemongrass peel, or limes. It looks so pretty and makes a delicious drink which encourages me to drink more water. I think that strawberries are tastier at room temperature, so I take them out of their nasty plastic box and put them in a pretty bowl. I have trained my husband to dump his wallet, keys and other detritus onto a silver platter which keeps them nicely corralled. Business envelopes are slipped into pretty silver toast racks instead of slumping in their tatty box. Rubberbands are corralled into a pretty round tin that once held mints and commemorates the Queen's Diamond jubilee. The most important thing though is to keep putting away after you have used something. Dirty dishes in the dishwasher, dirty cooking stuff a quick wash, dirty clothes in the hamper, beds made, towels hung up, and a whip around with the dust buster to get the obvious grot removed. "That excites me way more than a vacation – having a luxurious life every day!" Oh, this is so true. I love travel but long hauls flights are awful for me. Some of my extended family are positivity travel obsessed and can't understand how I'm not on the same page. Home is my favorite place, and especially when it looks chic and tidy! I agree with Melissa H. One of the best ways to keep your home looking resort-like is to keep everything picked up. Dirty dishes, discarded clothing, papers and books all dealt with and tidied away. Bathroom mirror and counter wiped and dried, and all grooming items put away. Beds made. Cushions fluffed. All easy to do if it just becomes a habit. One of my favorite treats - and possibly the most "elegant" thing I do - is to attend a symphony concert or a play. I cannot generally afford the prices of San Francisco performances, but my husband and I enjoy our local theatre company, and a nearby town has a quite decent community orchestra. We thoroughly enjoy dressing nicely and attending those events. You and the other ladies who commented are much more organized than I am, but I am probably better at spending. I know. You don't like to do it - but consider it. It's very fun. From reading about your dad, he'd want you to treat yourself to as many wonderful things in life as you could. You are sorting his estate, which is time consuming work, but when you're done, consider splurging on a thing or two just because he'd want you to. I know if I had a daughter, I'd want her to be responsible - like you are - but I'd also want her to be full of joy and not worry too much. Sometimes I'd just want her to go for it! Sounds like he went for it in life. Once in a while, it's OK if you do, too! --To me, luxury is affording someone to come in to do the deep cleaning in the house for me. I put that in my budget. --Luxurious, elegant, expensive perfume (and matching lotion) I buy and USE, special occasion be darned! My mom and I both had an epiphany a couple of years before she died - what the heck are we saving things for? She had perfume she'd saved for special occasions. After dad died, she hated that she hadn't worn it just for him. --She had beautiful china, silver, crystal packed away for 30 years in storage because her final house had no dining room. They were always “going to” build on a dining room. Never did. She unpacked it and used it all before she died. --Use the good stuff. What good is it doing sitting in the china cabinet? Set that dining table with your luxury dishes, every meal. And dishes only used for company? No more. Leland asked me once, "Who is more important than I am?" Not company, that's for sure. --High thread count sheets and a full on down (no feathers) comforter with closed baffles. Quality Egyptian cotton bath towel sets. Even if we have to buy one set at a time, once a month, eventually we have a luxurious, quality set of beautiful towels, sheets, etc. --As evidenced by the different answers, luxury - doing, having, being what you want. --I love what you ask yourself, "Is this luxurious enough for my new lifestyle?" and "Am I moving towards or away from what I desire my life to be like?" I'm adding those two questions to my shopping lists and thought process when I finally unpack my boxes to set up my new home. Thank you for the post! I noticed that your skin is looking especially lovely in the video. Can you share what skin care products you are currently using? Dear Fiona, I love that you are setting a wonderful example of embracing learning about new technology for us, your readers. However, I really do prefer to take in new information visually - thru reading. Could you post transcripts of your recorded videos on your blog for those of us who learn better visually rather than aurally?